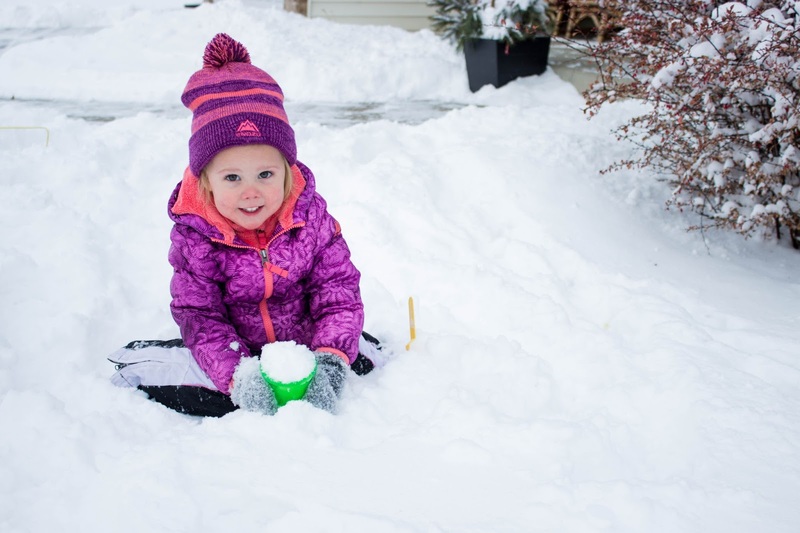 We got significant snow this week! 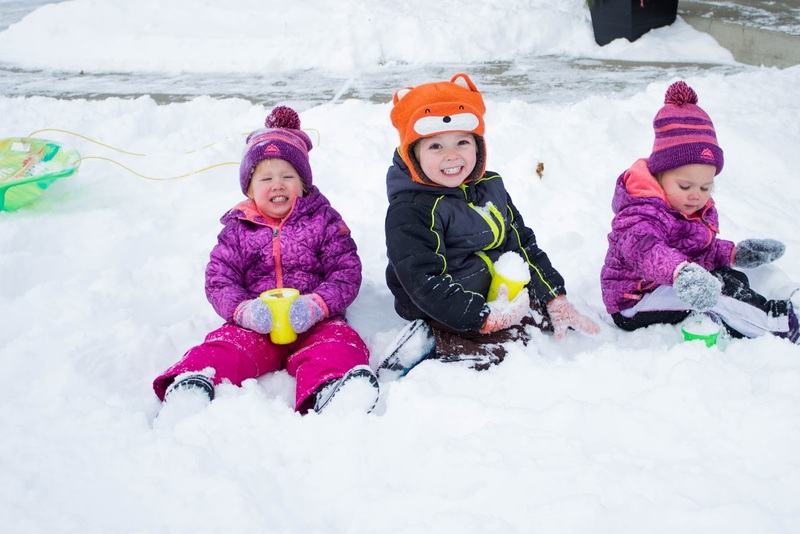 Kids had so much fun that they stayed out as long as it took to get all their snow gear on (not as long as it took to get it on and off, but still pretty good). 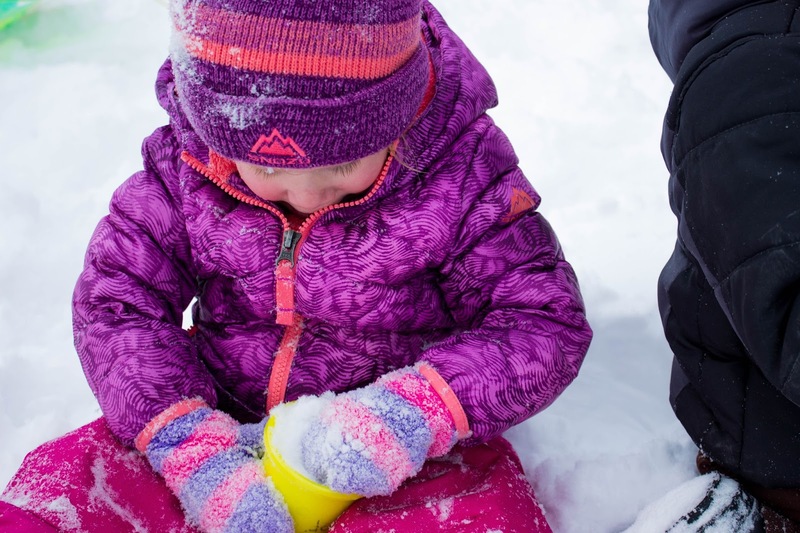 The trick was giving everyone a cup to play in the snow with. I cannot stop laughing at Jacqueline in this photo. This is the only one where anyone is looking, but even if there were a perfect one, this would be my favorite. I'm going to print it out just so I can laugh at it every time I walk by. But really, she's the cutest and sweetest and most kissable thing. We all know this. Just a first of many hilarious pictures. 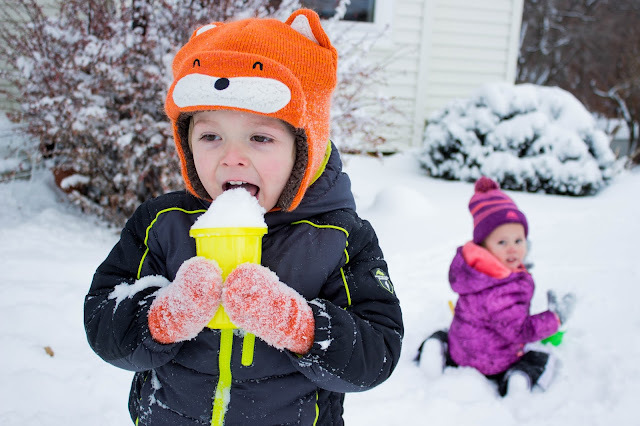 Wade kept asking to make sure that this snow was okay to eat - that it wasn't yucky or salty. 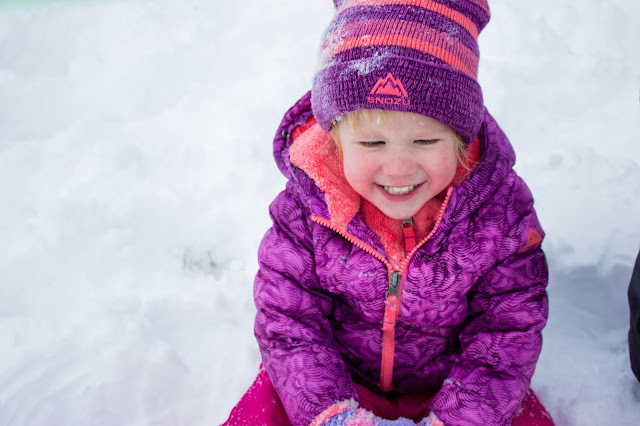 We've apparently have a lot of conversations about what snow is good to eat and what snow isn't. But really, other than the fun snow, this week was entirely about sleep. Or lack there of. So much lack. I guess there's such a thing as two year old sleep regression. But it feels more like them being turds and the universe kicking us in our shins. For naps today I took away a blanket or pillow each time they got up and made them stand against the wall for a minute - if they didn't want to sleep then they get to stand. They finally passed out snuggled together in the corner of their queen bed - look at that little finger of comfort. Standing. Jac still saying cheese, cause I had my camera out. Notice the empty room. No adorable headboards. No toys. No blankets. What you can't see is that there are also no lightbulbs. It worked - tonight they feel asleep by 9. Better than the after 10 bedtime they've been opting for. Oh, but they do have blankets on them tonight. And pillows. We gave them back. This was the scene we were coming into every morning (or in the middle of the night - lights were always on). 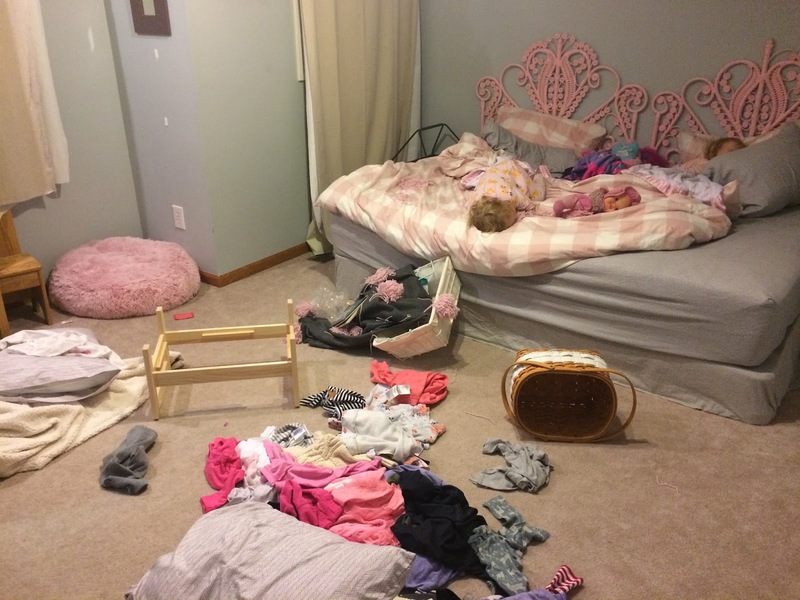 All the clothes out of their dresser. Breaking the wicker on their headboards. Missing frames from the walls. General mayhem. Everything is now in the closet and the closet now has a lock on it. My enjoyment of my children is tied to not having a disaster to clean up after every nap. And it's an angry mess - they're mad about bedtime, so they have to open things and throw things (Blake's newest tantrum is to open up all my kitchen cupboards). I feel devastated that their cute room is bland. I've been working on it and it was getting so cute! They couldn't care less, but I do. I'm hoping that they'll refigure out sleep and I can enjoy all the sweet cuteness that is their room. Oh, and you may recall that last week Blake destroyed a pompom blanket I made. I made two, and I hid the other one in the closet, on a shelf, with a chair in front of the door. She apparently shimmied past the door, climbed the shelf and got the pompom blanket - like some pompom seeking bloodhound! How did she even know it was there? How did she even know to be so persistent? Well, she destroyed that one too. I saved about 7 pompoms that I'm sure I'll put to good use. Unless Blake, the bloodhound, finds them first. One night we came up to check on them. Their light was on. They weren't in their room. The closet light was on. They weren't in the closet. Our room door was shut. They weren't in our room. We found them in Wade's room, up against the door - finding solace with their (sleeping) brother. Last night was perhaps the worst night. We tried splitting them up having one in Wade's room and having Wade sleep in their room with the other. It didn't work, but Wade was so excited to sleep with them, so we attempted to let them all sleep together. It was cute - I could hear Wade telling them to lay down and fall asleep. I felt like Jekyll and Hyde - going in with patience to see what they needed, just to come in the next time spanking bums and yelling. Wade ended up going to his own bed around 9:30 and falling asleep immediately (so sad it was like he was being punished cause his sisters kept him up) and that's when the girls started losing blankets - it was effective. An added bonus this week has been that they're really tired so they're also really grouchy! Woohoo. It also didn't help that I had a few down days this week (one bad headache and one day with terrible vertigo!). On the vertigo day Jac found me in bed, snuggled up to me and then I heard her start to breath loudly. This has never happened! She fell asleep at 11 am. Okay, sleep stuff is over. 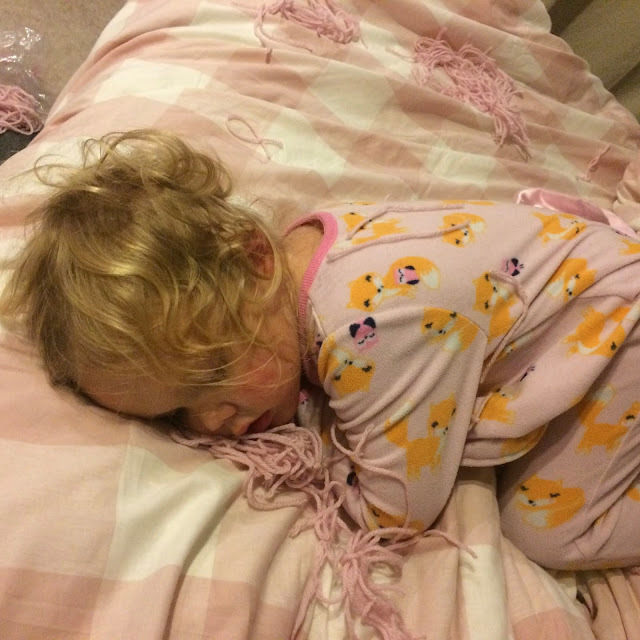 This very long post and all I've talked about is my crappy sleepers. Here's a picture of Blake. Playing with curtains. Cause they're fun. And my rubber bands that I use for pillow dyeing (shibori, so it sounds cooler than tie dye or crafting). Oh man, that was my big project this week and I forgot to take a picture! Isn't that always the case? I organized all my craft crap! It looks so awesome, and I used the pompom blanket carcasses to cover up some boxes to really make it so perfect. And one more of Blake, putting fruit snacks on the fish tank. Perhaps I shouldn't post this, cause then husband will see it and be less than pleased. Husband did get two new fish this week - not that I remember what they're called, they're both orange. Sheesh, how did Blake steal the show this week? Cause she's a disaster. Daddy brought home cupcakes from work with purple frosting, it dyed her and her spot pink. Oh and this outfit. She's wearing this outfit because I was thrift shopping on Monday (50% off day!) with friends and one of my friends kids were watching my kids (it was heavenly! And so fun cause my friend started a new job and we were able to help her outfit herself for it...and I found myself plenty too) and Blake pooped through her pants while they had her (I super owe them!). They just took her pants off and I bought this jumper for her from the thrift store. Got to their place and put it on her - it's a 2T and it's too short and gives her a wedgie! When did my little girls get so big? I pull out more 2T clothes to be put away each time I do laundry. But luckily there's a lot of pink stuff from their cousin that Jac is now able to wear. I've been watching Craigslist for an IKEA Pax wardrobe for over a year - they're so expensive! But I finally snagged one - the picture they posted had the door sticking out a little, so no one wanted it, but it was just a box sticking it out. Anyway, I got it for $75 (less than half of what they originally listed it for, pictures matter!) and fit all 93" of it in my car, with the trunk shut. This car has been amazing to me. Now the the wardrobe is lying on my front room floor and has already had a few stickers placed on it that I needed to scrape off. Let me add that these weren't just stickers, they were stamps. So very expensive stickers - luckily they thought the big logo stamp sticker was the coolest, so only two actually stamps were used. It'll go in Wade's room - now that the girls room is disassembles, I'll focus on his room with all of my winter-time stir-crazy energy. Wade's been the best little helper this week. As best a four year old can be. I keep hearing him say things like "Jac, come hide with me!" or "Blake, run with me like this!" The highlight would be today, we had to get out and ended up at Target. Everyone got a $1 slinky, on the way home Blake dropped hers on the floor and I couldn't reach it - so Wade gave her his slinky. One of the sweetest moments of motherhood yet. One last thing that defined this week for me: black beans. Husband decided we should eat more black beans and rice (from his mission. I'm wondering if he's forgetting that he got really fat on his mission...). Well, we had this unopened, 25 pound bag of black beans in our food storage of undetermined age (at least 6 years old cause it's been here since I've been in the family...my guess is older). Anyway, it took two dismal fails before realizing that the seal on my instant pot got off a little and that I had to really presoak these old beans before cooking them. The fails were taken extra hard cause this week felt like a failure, but of course I fixated on the beans, cause why not. But then today, I got it right and they were delicious! And now we all have gas.